Be at the big match, see your favorite football team and players in the flesh, the roar of the crowd - the build up, the exhilaration and of course the game. There is nothing like the feeling of actually being at the big match, seeing your favorite football team and players in the flesh, the roar of the crowd, the build up, the exhilaration. 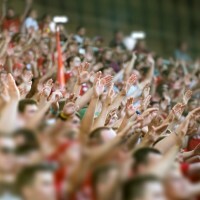 Whether it's your local or national team, going to watch a football match with your friends and family is always a unique, exciting and fun event. Whatever the match, no matter if you love being in the stands or fancy getting box seats, just let us know and we will make it happen. After the match, why not celebrate with a meal organised by us, or grab a burger and head off for a VIP evening at a night club or wine bar - you could even go in style, being driven in a luxury stretch limo!